Achieving the perfect cat-eye is no easy feat—but lucky for makeup aficionados everywhere, Instagram user Makeup By Sugar has figured out a way to make winged liner basically foolproof. 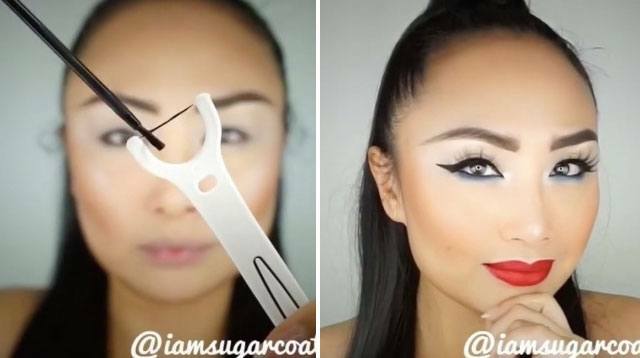 In a video posted on her Instagram page last month, the makeup artist demonstrated a brilliant beauty hack you'll immediately want to add to your arsenal: by demonstrating how to use dental floss to create the perfect cat eye. First painting liner on the floss, Makeup By Sugar then used it like a tiny stamp on her eyelid, once for the bottom of the flick and once for the top. She then filled in the middle and completed the line across her lid, before revealing the most perfect wing you've ever seen. Clearly having tried this a few times, the makeup genius cautions not to try the hack with mint-flavored dental floss—which I imagine would burn quite a bit. But as long as you have the classic, unscented stuff, you should be good to go. You can check out more of Makeup By Sugar over at her Instagram right here.